Clint Eastwood's Changeling is a finely crafted, no-nonsense, concise telling of an extraordinary true story. This is hardly surprising when you consider Mr. Eastwood's career and the cinematic greats he learnt his trade from. The influences of the likes of Don Siegal are often evident in his work. In the hands of a lesser director, it would have been so easy for the more sensational aspects of the plot to have turned Changeling into a melodrama. Yet Eastwood’s minimalistic style actually creates a sense of docu-drama and certainly allows for a greater focus upon honest and credible performances from all concerned. The production design by James J. Murakami and minimal use of digital effects does well in capturing the aesthetic of the period and there is a strong sense of atmosphere. Yet these embellish the film and do not get in the way of the story telling. 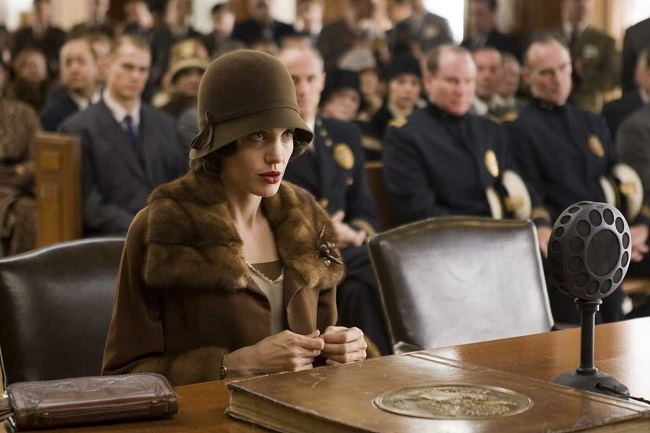 Angelina Jolie excels in her role as Christine Collins and her performance really should have garnered greater attention at the time. The cast of character actors including John Malkovitch, Michael Kelly and Colm Feore all acquit themselves well. The screenplay by J. Michael Straczynski is focused and credible. It accurately portrays a Mother’s desperation to find her child as well as her shock when the very authorities she trusts to help, turn upon her. It is also interesting to note that the tangential story of the Northcott Murder’s is kept in the background and is not a key focus of the film. This is very much the story of Christine Collins and how she fell victim to a corrupt system, as opposed to an exploration of a “sensational and lurid” child murder case. Eastwood does well in keeping the story within very clear parameters and not casting his net too wide. Changeling takes an interesting stance with regard to capital punishment and contains a rather clinical depiction of a hanging. Whatever your own personal views on the death penalty, this scene is very powerful and is certainly food for thought. Clint Eastwood has once again proven that he is a director of note and that he has a strong grasp of what constitutes a good story. He has crafted a film that maintains intellectual integrity and doesn't concede to melodrama, despite the “based on real events” moniker that prefixes the film. This is lean, well written, well-acted and focused film making and it not only provides a solid evenings entertainment, but a succinct example of how you make a quality drama.